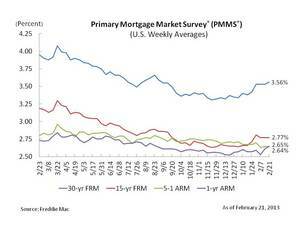 MCLEAN, VA--(Marketwire - Feb 21, 2013) - Freddie Mac (OTC: FMCC) today released the results of its Primary Mortgage Market Survey® (PMMS®), showing average fixed mortgage rates changing little over the past four weeks which is helping to spur new home construction. After being flat for three straight weeks, the 30-year fixed edged up to 3.56 percent, while the 15-year fixed remained unchanged at 2.77 percent. 30-year fixed-rate mortgage (FRM) averaged 3.56 percent with an average 0.8 point for the week ending February 21, 2013, up from last week when it averaged 3.53 percent. Last year at this time, the 30-year FRM averaged 3.95 percent. 15-year FRM this week averaged 2.77 percent with an average 0.8 point, the same as last week. A year ago at this time, the 15-year FRM averaged 3.19 percent. 5-year Treasury-indexed hybrid adjustable-rate mortgage (ARM) averaged 2.64 percent this week with an average 0.5 point, the same as last week. A year ago, the 5-year ARM averaged 2.80 percent. 1-year Treasury-indexed ARM averaged 2.65 percent this week with an average 0.4 point, up from last week when it averaged 2.61 percent. At this time last year, the 1-year ARM averaged 2.73 percent. "Mortgage rates have been relatively stable, hovering near record lows, for the past four weeks which is helping to spur new home construction. For instance, new construction on single-family houses rose to an annualized rate of 613,000 in January, the most since July 2008. In addition, single-family building permits were up to the highest issuance level since June 2008." Average 30-year fixed-rate mortgage up a smidgen.